This week Michael decided to subject me to an Australian song. Instead of immediately launching into my usual second-by-second appraisal of the song, I’ll let you know what I thought of it in the next paragraph. Then after that I’ll offer my regular time-lapse account of my responses to the song. 0:00-0:37 – This is one long, dull introduction that I’ll break down into its separate uninteresting components. a) 0:00-0:15 – A simple guitar strum involving four chords. There’s not much I can say about this, because it’s not really doing much except letting you know that the introduction is a guitar playing four chords. Production note: The effect applied to the guitar sounds to me like a bad plate reverb. c) 0:19-0:37 – What a letdown. This is simply the verse without the singing. Speaking from a songwriting perspective (says the man who’s pretending to know how to write songs), this is risky, because usually when you want to hook the listener you do it with a hook – i.e., a catchy tune, whether it’s a vocal melody or a guitar lick. Here’s there’s nothing but two chords played over and over again until the sing comes in and begins the verse properly. By the way, why are little tunes played on guitars called “licks”? I don’t know how on Earth anyone could have come up with the idea of giving that name to a musical activity that has nothing to do with licking. 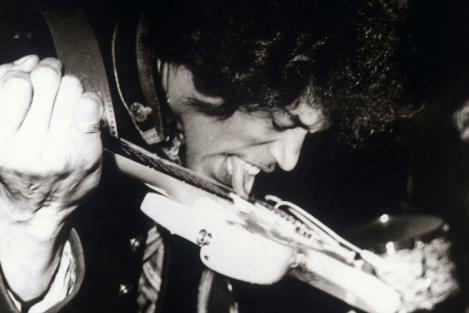 I can imagine it be appropriate for Jimi Hendrix who occasionally did his tongue thing whilst playing guitar – but that’s Jimi Hendrix, and if ever the term “guitar lick” was used, I think it could only apply to him. 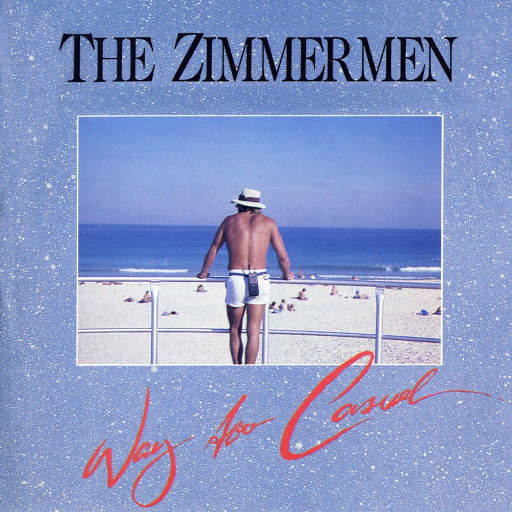 Listening to The Zimmermen, that’s where I was. 0:37-0:55 – Finally we get to the verse. That took way too long. Unfortunately, I don’t think the melody for this verse was worth waiting for. I find it very ordinary. (Maybe I can make that sound more flattering by saying it’s très ordinaire. Or maybe not.) Hmm. The singing of the phrase at the end of this first verse (0:50-0:52) is dodgy with a capital “D”. 0:55-1:13 – Oh. It’s the second verse, and it’s just like the first one (“Très ordinaire mon ami!“) but with some harmony vocals. Actually, the harmony vocals aren’t harmony vocals at all – they’re mostly singing the same notes as the lead singer but an octave lower. I’m afraid I’m not finding those harmony backing vocals very interesting. Oh-oh. The lead singer’s singing of the phrase at the end of the second verse (1:08-1:10) is dodgy as well. It’s the same phrase both times, but he has trouble singing it. 1:13-1:13 – This is the bit before the chorus. Some people call it a pre-chorus, but I usually call it the bridge. Whatever you call it, it’s a little interlude stuck between the verse and chorus to let you know there’s a chorus coming up. Yay! I’ve finally come to a part of the song that I like. This bridge has a drone. Now, I’ve mentioned this before, but I’m a-gonna mention it again: I love drones. They’re a musical device whereby a tune is repeated but the bass notes change. In this bridge it’s the guitar playing the drone. The pesky lead singer obscures it when he sings, but he does stop (thank you, lead singer) and you can hear the drone very clearly from 1:24-1:28. 1:13-1:46 – Oh no. I thought we were, at long last, going to get to the chorus – but no, we’re back to a repeat of the intro (i.e. a verse without vocals). This song’s going nowhere fast. 1:46-2:04 – And another verse. Does this song have a chorus? Good-o. During this verse there’s an interesting (well, it’s interesting to me) bit of background singing (from 1:52-1:58). It’s sort of in the form of a round, where you have someone singing a melody, and while that person is singing the melody someone else sings the same thing a bit later (think “Row, Row, Row Your Boat“). 2:04-2:19 – And another bridge. Are we ever going to get to a chorus in this song? 2:19-2:23 – Good. There’s a one-chord build-up here. To the chorus. 2:23-2:49 – What? A guitar solo? Was there a chorus and I missed it? What’s going on here? As for the guitar solo, I think it’s undistinguished (except for the guitarist messing up his rhythm at 2:48). 2:49-3:11 – The singer has come back, and he’s warbling away. But at 2:56, while he’s warbling away, the song’s fading out. What is going on here? I’m thoroughly confused. The song went by, it was unmemorable, and during most of it I was singing the chorus “Do They Know It’s Christmas?” in my head. (“Feeeeed the wer-erld…”) The song’s finished and I still have that Christmas song in my head. I’m going back to my King Crimson marathon. You are currently browsing the archives for the Zimmermen category.